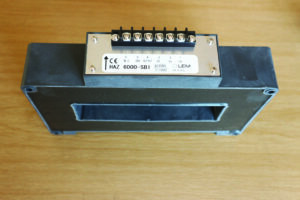 LEM of Geneva Switzerland offer the HAZ series of high-current transducers. The family includes six models capable of measurement of 4000 to 20 000 A. The window will accommodate busbars of up to 162 x 42 mm. The HAZ series are available in six industry standard outputs: ± 20 mA, 4-12-20 mA, and ±10 V for bipolar applications. HAZ series are also available with True RMS processes in 0-20 mA, 4-20 mA and +10 V output. Accuracy is ±1% and units have been tested for isolation of 17 kV, 50 Hz, 1 minute. Typical applications will include railway traction substations, electo-winning of copper, platinum and other precious metals. Electo-chemical processes for example, chlorine production is also a common application. HAZ series are ideal for the replacement of shunts, as there is no insertion loss, accuracy is improved, and galvanic isolation is provided. The post DC high-current transducers appeared first on EE Publishers.